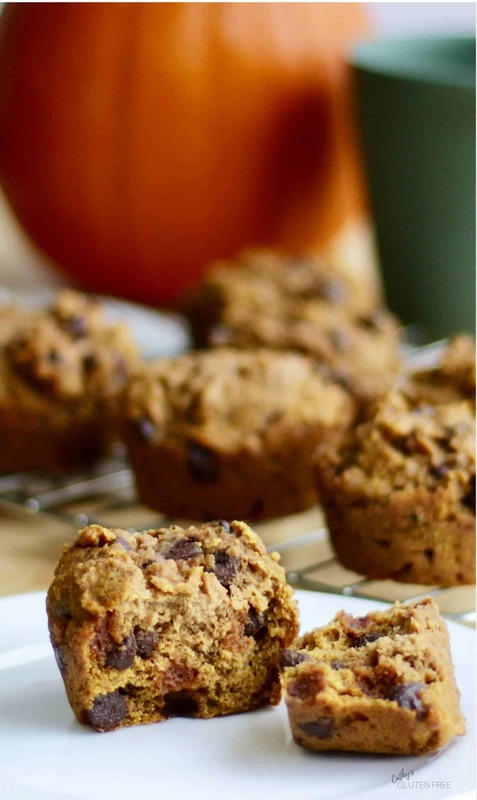 Gluten Free Pumpkin Spice Muffins can be made with either chocolate chips or raisins. It’s your choice! We really like them with raisins, but I know that taste is not shared by everyone. 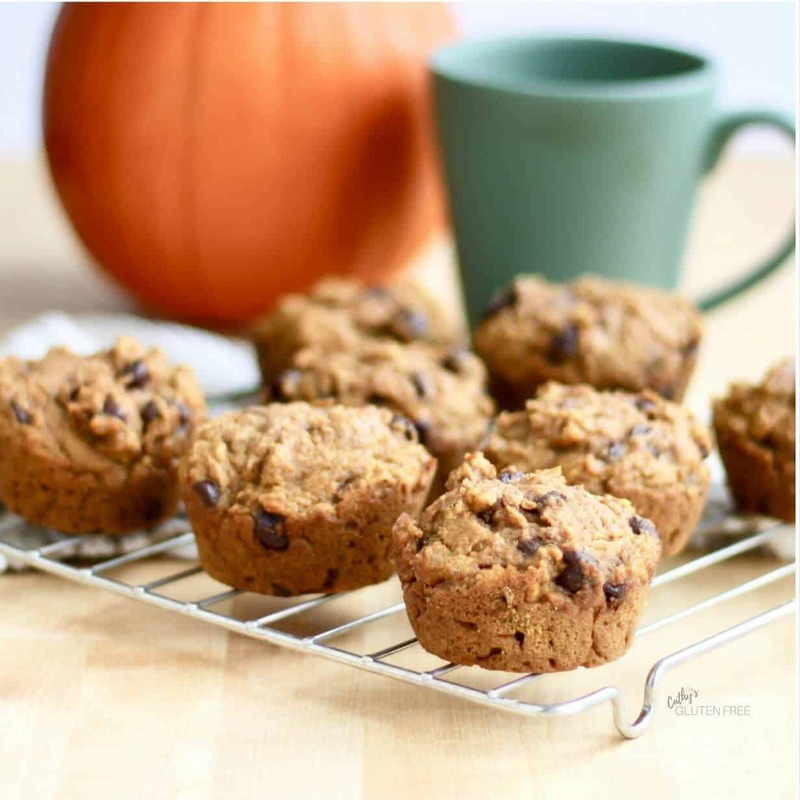 Pumpkin Spice Muffins are great for breakfast or a snack anytime! If you think of it ahead of time, set your eggs out so they come to room temperature. That goes for your pumpkin puree, too, if it happens to be in the fridge. If I’ve cooked my fresh pumpkin ahead or already used some from a can, mine might be in the fridge. If you add too many cold ingredients to your batter, they will cause your coconut oil to harden and be difficult to mix. This recipe calls for pumpkin puree. Don’t use pumpkin pie filling. It’s easiest to just buy a can of pure pumpkin. 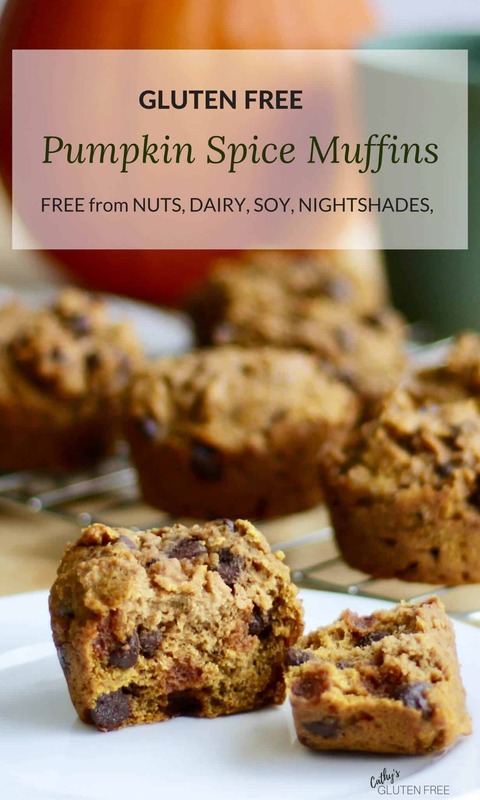 Gluten Free Pumpkin Muffins taste great! You could make your own pumpkin puree from scratch, though. For that, you’ll need a small pie pumpkin not a big jack-o’-lantern pumpkin. Wash the dirt off the outside of the pumpkin. With a big, sharp knife, cut the pumpkin in half from the stem through to the bottom. Scoop out the seedy insides. 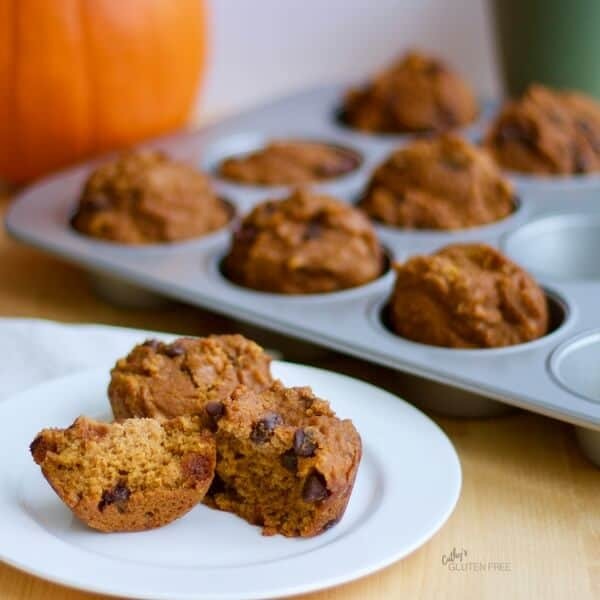 Place the pumpkin halves cut side down in a baking pan. Add 1/4″ of water. Bake in 350F preheated oven for 45 – 60 minutes until soft inside. Scoop the pulp away from skin, and store it in the refrigerator. 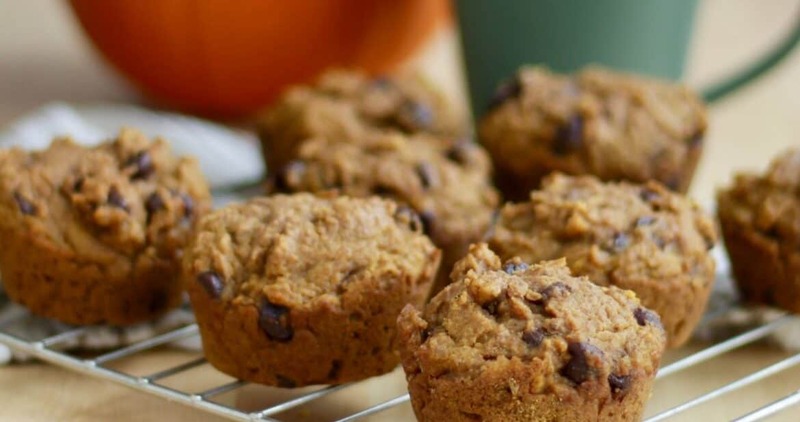 If you’re in a hurry, you can make these muffins by just throwing everything into a food processor. However, just be aware that they won’t be as fluffy if you do that. The purpose of the beaten egg whites is to incorporate air into the muffins to lighten them up. It takes a little more effort, but it’s worth it. Beaten egg whites hold lots of air. The trick is to fold them in gently, so you don’t beat the air back out of them. Once you have added beaten eggs whites to the batter, it must be handled as little as possible. In a small mixing bowl, whisk together pumpkin, maple syrup, melted coconut oil, vanilla, and egg yolks. Beat egg whites until soft peaks form. Gently fold into the batter. Stir in the chocolate chips or raisins just until they are fairly evenly distributed. Divide batter into 12-cup muffin pan. Bake for 17 minutes or until done. You'll know they are done when you poke a fork or toothpick into the centre of one, and it comes out clean.